The AL003 Tilt-N-Tote is a lightweight, yet capable wheelchair carrier. The AL010 is compact in size and lightweight. AL030 Power Tote makes it quick and easy to transport a manual folding wheelchair. The streamlined design of the AL015 Micro Scooter Lift features an open platform design with a simpler, smaller silhouette. The AL160 Outside Scooter Lift has an open platform design that is simple and easy-to-use. The AL100 Universal Scooter Lift is today's most popular outside scooter lift. The AL500 is an easy to operate and is built to last for years of trouble-free use. The lightest solution on the market providing more options! 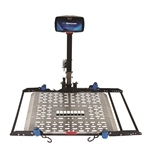 The AL 580 is a compact, durable and American-made outside vehicle platform lift that safely and securely transports power wheelchairs. The AL300 Fusion Lift is a versatile power scooter and wheelchair lift that is convenient. The AL560 outside lift is designed to meet the needs of users who need a quick, automatic, and secure option without making ay modifications a power chair. The AL570 is an automatic, compact, and lightweight. A Harmar exclusive, the unique design of the AL301 XL Fusion lift makes it an ideal solution to safely and securely transport today's largest chairs and scooters. The AL225 is an innovative boom style lift with a medium capacity, offering an economical version of the heavier-duty AL 425.